Long time readers of our newsletter know that we have bunnies as well as our cats. When we adopted Madeline, who became our Chief Feline Officer, she needed a name. The shelter had called her Spice but it didn’t suit her. So we opened up a contest to readers to name her. Her full name became Madeline Silver Belle. The winner received 4 cat toys. Here are our new bunnies! They are very young brothers. 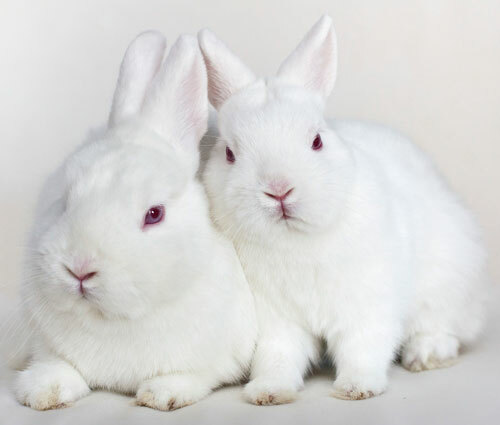 They are what we bunny fans call “rubies” as they have white fur with ruby colored eyes. Currently they are named Marshmallow and Tiny. Tiny is the tiny one who weighs about two pounds. They will be the companions to Ralph, a 7 year old Dutch bunny. Yes, it’s a bromance! Put on your creativity cap and send us some cute names! Send them to catfaeries@catfaeries.com with the subject line “New Bunnies Names.” As before, the winner will receive 4 cat toys! Free Long Distance Energy Healing for animals! Sunday February 2nd. Energy healing is an amazing skill that your cat faerie learned many years ago. Every now and then she welcomes newsletter readers and Cat Faeries customers to sign up their sick or elderly animals to receive the benefits of a healing session. Free of charge. It’s a gift to our friends in the animal kingdom. You do not need to be sitting with your furry or feathered friend for the benefits to be felt. But people email after to say that if they did hold their animal and they could feel the healing vibrations and they could observe subtle changes in their friend. People tell us that it’s a very rewarding experience for all. If you wish to join in during that time either with prayer, meditation, invocation, songs, chanting, etc. – join us during any time during the 45 minute session. While we don’t require that you email us after the healing we really love to hear from you with your impressions of how your furry friend responded. It’s a new year and a great time to start to shop around for a new veterinarian. Did someone new move in last year? If yes, check them out! You could be in for a delightful surprise. Call every groomer, pet shop, dog walker (even if you only have cats) and cat sitter in town and ask for referrals. A good veterinarian is worth their weight in gold, platinum, and diamonds. How many of you cats out there enjoy going to the vet? Raise your paws. That’s what I thought. Just thinking of a car ride sends shivers up my spine! However, we all know that regular visits to the vet are essential for maintaining good health, so I’m going to give your people some hints on choosing a good doctor for their favorite felines. We deserve quality care with minimal stress! Have you noticed that some clinics now specialize in cats only? This is worth considering, especially if there are no dogs in your family. It suggests the vet and staff are attuned to the particular needs of cats. However, there is no reason a cat can’t be treated properly in a mixed practice. If you are looking for a new veterinarian don’t pick a clinic just because it is close to you. Few vets handle their own after hours emergencies these days, so saving a couple of miles driving shouldn’t be the most important factor. Find out where the Emergency Clinic is or how local vets rotate emergency responsibilities. The following is a true story. 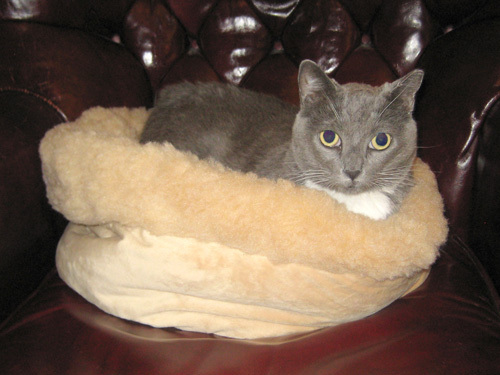 When Mrs. S. moved to a new state she took her chronically ill cat to the closest vet. She explained Kitty’s medical history and was expecting blood to be drawn to assess her current condition. Dr. X. laughed and said he didn’t think blood work was necessary since he didn’t have a big car payment that month. Apparently he thought she would appreciate the humor and his “client friendly” views on charging for unnecessary services. However, she was horrified by his insensitivity and never went there again. If possible try to get references from friends who have pets. Who is their vet and why do they continue to go there? Are they thinking of changing? If so, where else might they go and why? The ASPCA has published a guide for choosing a veterinarian (general practice), http://www.humanesociety.org/animals/resources/tips/choosing_a_veterinarian.html, but YOU must decide what is most important to you. The example of Dr X. illustrates the importance of good rapport between client and vet. If you don’t feel comfortable with the doctor how can you trust that your cat will be treated appropriately and with compassion? Most cats will be shy or fearful in a clinic setting. Does the vet talk softly and treat your cat as gently as possible? Are you allowed to be present when blood is drawn or vaccinations are given? If the staff insists that these things must be done in “the back” a red flag should immediately appear. What don’t they want you to see? Does the doctor explain procedures, diagnoses and recommendations in language that you can understand (without talking down to you)? Are you given options for treatments? Are the possible outcomes of different tests/procedures and medications explained? Does he answer questions to your satisfaction? Overall, do you and your cat feel comfortable with the person you are literally trusting with your cats life? If not, don’t be afraid to look elsewhere. However, if you are happy overall and concerns are minor try to work out solutions. A good relationship takes effort from both sides. I hope these guidelines will help people to make informed decisions when choosing a vet for their special cat companions. (By the way, my person trusts my doctor completely and she has known a lot of veterinarians!) Next time I plan to talk about the cat vaccination controversy. Winter is a cold and potentially dangerous time of year for feral and homeless cats, whether or not a polar vortex is pushing arctic air into your neighborhood. Here’s some ways to help. Alley Cat Allies is a national advocacy organization dedicated to the protection and humane treatment of feral cats (www.alleycat.org). You may have seen their “I’m an alley cat ally” ads featuring Hollywood personalities including Portia De Rossi. Alley Cat Allies has posted a good article on how to help feral cats during the winter at www.alleycat.org/WinterWeather. Another way to help is to contact one of your local feral cat organizations. Alley Cat Allies has a posted a contact form at www.alleycat.org/sslpage.aspx?pid=1452 so they can connect you with an organization in your area that is a member of their Feral Friends Network. They also have a National Cat Help Desk that you can contact via www.alleycat.org/sslpage.aspx?pid=1453. You can also find local feral cat assistance groups by doing search via Google for “feral cat (insert your city or area).” Contact your local group and ask how you can help. One of the best ways to help feral and homeless cats during the winter is to provide shelters to keep them warm and out of the weather. Here’s a great video on how to make a simple low cost shelter from a plastic tote box. It even includes a cute cat helper providing supervision. So get out there and help feral cats this winter. You may make some new friends – both human and feline. Are squirrels driving your cat crazy? In 1997 when we shifted our focus to Feliway and helping cats get back to the litter box we quickly realized that one of the key triggers that caused stress for many indoor cats which can lead to litter box avoidance was the pesky presence of those cute bushy tailed rodents: squirrels. Squirrels running around outside have sent many a cat over the emotional edge. Most cats find them to be cheap entertainment. But many cats find squirrels to be very annoying or threats to territory and this can lead to retaliation: peeing outside of the litter box, often right under a window. Even if a sensitive cat never sets foot outside (which is good, keep em indoors!) squirrels run along window sills, up and down trees, they get into bird feeders, and other antics all under the watchful eyes of our indoor cats. We have long suspected that the quick ways squirrels zip around can really annoy and taunt cats. The defiant flicks of squirrel tails agitates many cats. And then there is that chittering sound they make. Traits that might seem cute to us often really irk and threaten even the most mellow feline. 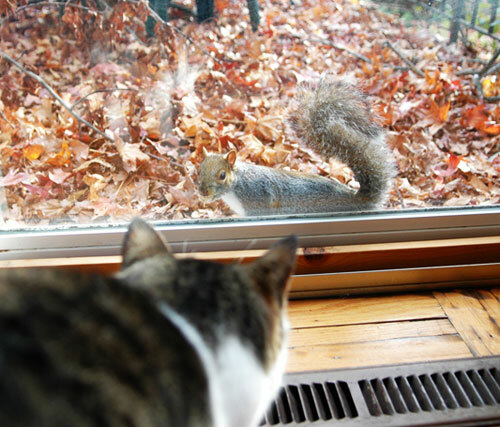 A very easy solution to help steady your cats’ nerves is the feed squirrels (and birds) out of view from windows and at the farthest place on your property. 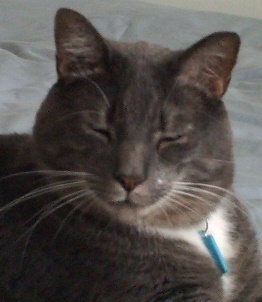 1)	The pheromone is calming to your cat, less fighting among your feline family.